Words cannot describe the sweet treats that are made here. You just need to place your order and get one of everything. I ordered 2 cakes this time around, the most delicious and decadent desserts. I have been and will continue to be a River Street Sweets fan! PURCHASED FOR A DEAR FRIEND OF MINE WHO HAS NEVER BEEN TO SAVANNAH. 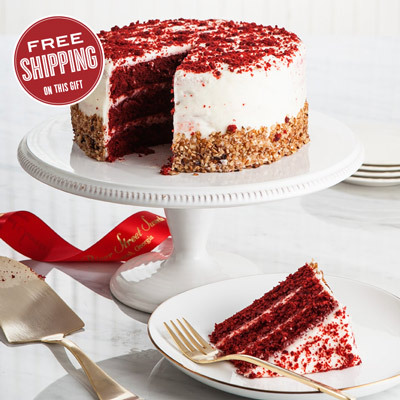 i THOUGHT A PERFECT INTRODUCTION WOULD BE TO PURCHASE A RED VELVET CA KE FOR THE HOLIDAYS. FIRST, OF ALL, AFTER I SENT IT TO HIM, HE SAID HE HAD NEVER HEARD OF A RED VELVET CAKE AND AFTER HE TRIED IT, HE LOVES IT AND RAVED ABOUT HOW DELICIOUS IT IS. We shipped the red velvet cake to our relatives for one of our Thanksgiving Day dessert treats. It was absolutely delicious and a hit. It arrived quickly and in perfect condtion. A wonderful cake: fresh, moist, and most of all, delicious.